Looking for movie tickets? Enter your location to see which movie theaters are playing No Escape near you. 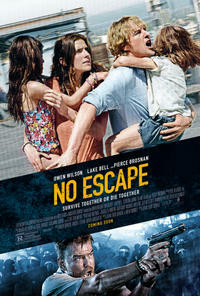 An intense international thriller, NO ESCAPE centers on an American businessman (Wilson) as he and his family settle into their new home in Southeast Asia. Suddenly they find themselves in the middle of a violent political uprising. Forced thrills can't hide this movie's ugly xenophobia.